How many flowers do you see in the photo below? If you said one, that’s the answer I was looking for. However, it’s not correct! The plant pictured here is Green-headed Coneflower (Rudbeckia laciniata), also sometimes called Cut-leaf Coneflower in deference to its deeply lobed leaves. Green-headed Coneflower is a member of the Aster, or ‘Composite’ family, a name that’s pretty descriptive of their typical flower clusters (inflorescences). What our brains think is a single flower is actually a cluster (or composite) of tiny flowers, often of two different types, ray flowers and disk flowers. The petal-like parts of the flower cluster are each an individual ray flower with a single petal. In the center there are dozens of tiny tubular flowers called disk flowers, in reference to the disk-like shape of the flower cluster. In the picture above, just a few of the disk flowers are blooming. 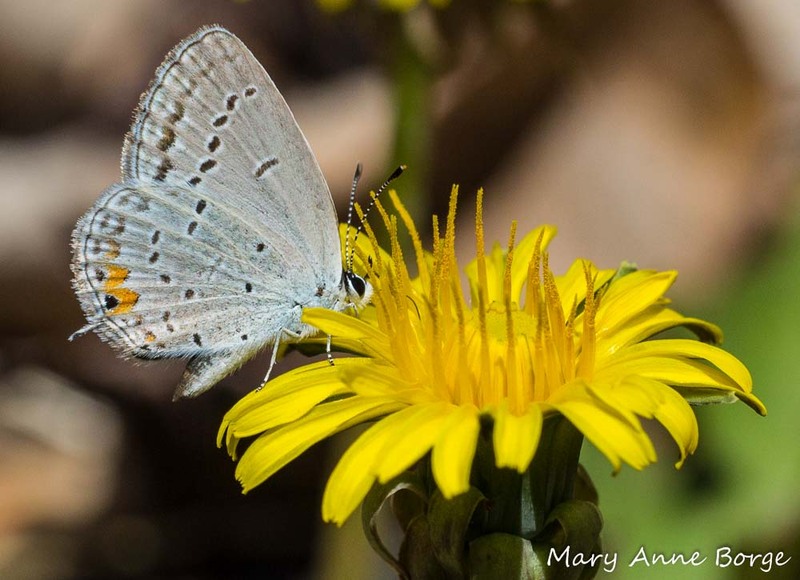 Some Aster family members just have ray flowers, like Dandelions. Some have just disk flowers, like New York Ironweed. Many, like Green-headed Coneflower, have both types of flowers. 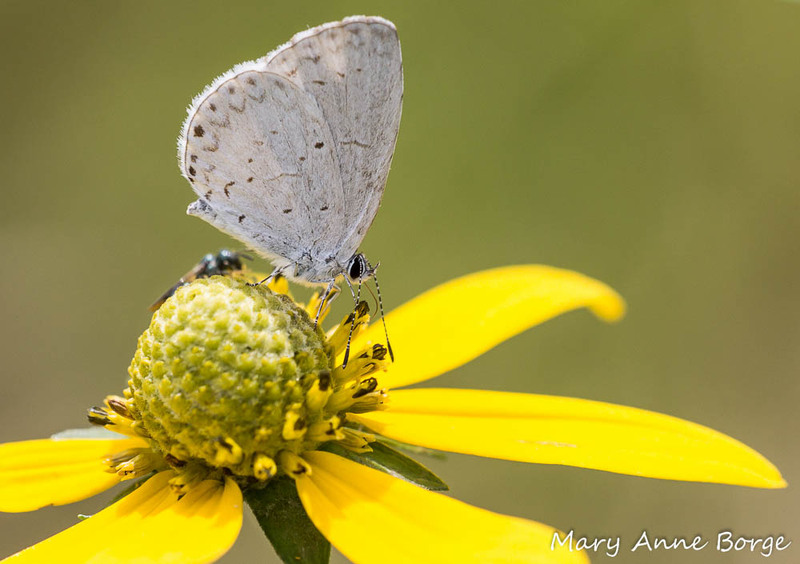 When both ray flowers and disk flowers are present, the ray flowers are often sterile, in which case their primary purpose is to act as nectar guides, alerting pollinators to the availability of nectar and pollen in the many disk flowers at the center of the flower cluster. 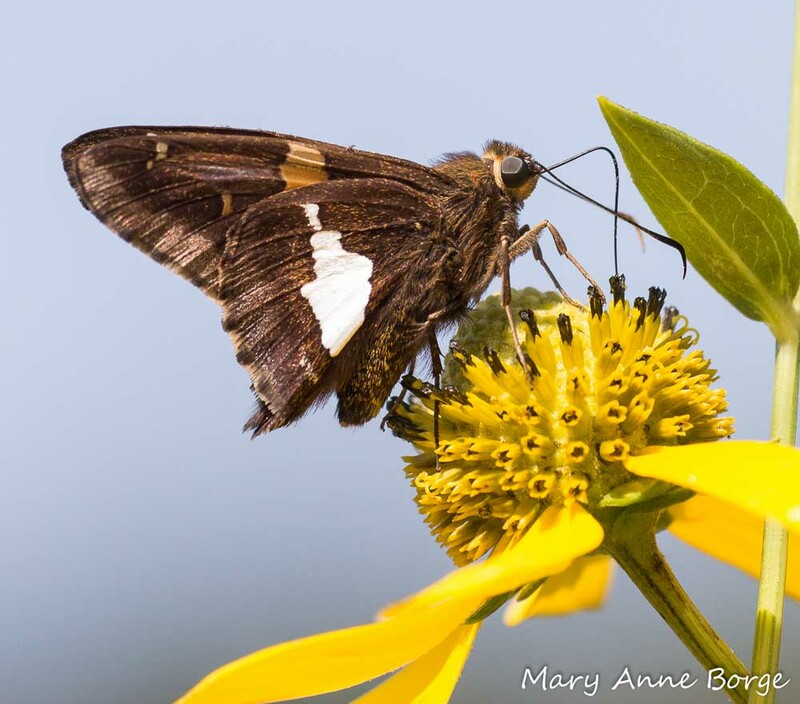 A Silver-spotted Skipper is nectaring on the disk flowers that are in bloom on this Green-headed Coneflower. The lowest disk flowers have finished blooming, while those at the top of the flower cluster are still in bud. The disk flowers bloom gradually over a period of a few weeks, maximizing the plant’s chances for pollination with the assistance of insect partners. In the case of Green-headed Coneflower, the disk flowers bloom gradually from the bottom, or outside ring, to the top, or center, of the flower cluster. 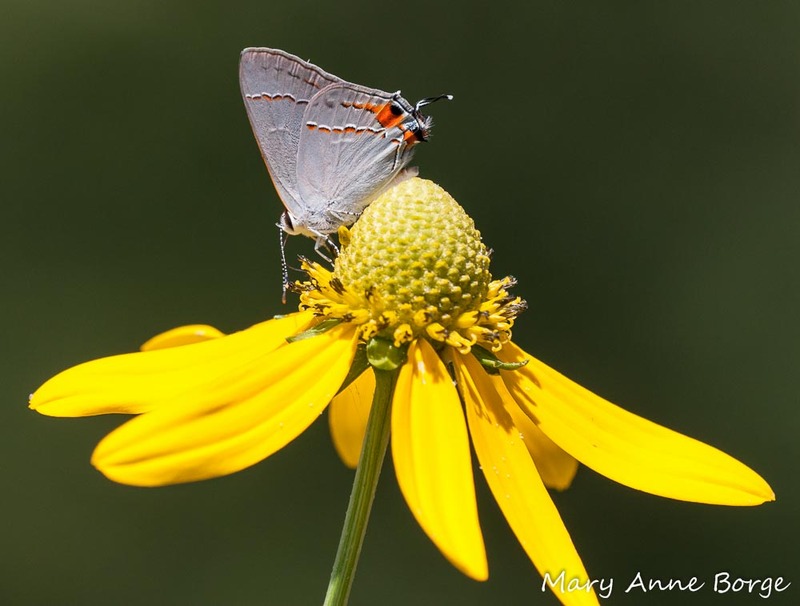 A Red-banded Hairstreak is drinking nectar from the last few blooming flowers of this Green-headed Coneflower inflorescence. 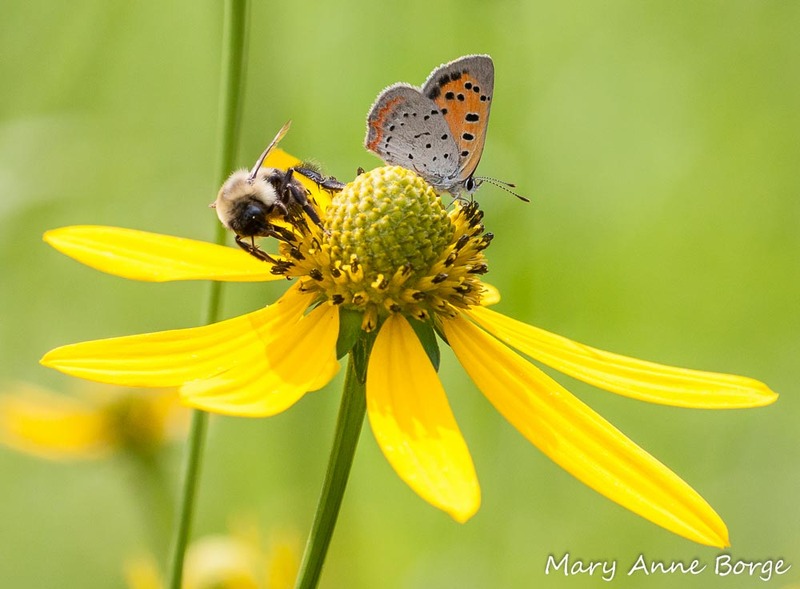 Because of the number and size of its disk flowers, Green-headed Coneflower is able to attract many insects as potential pollinators. 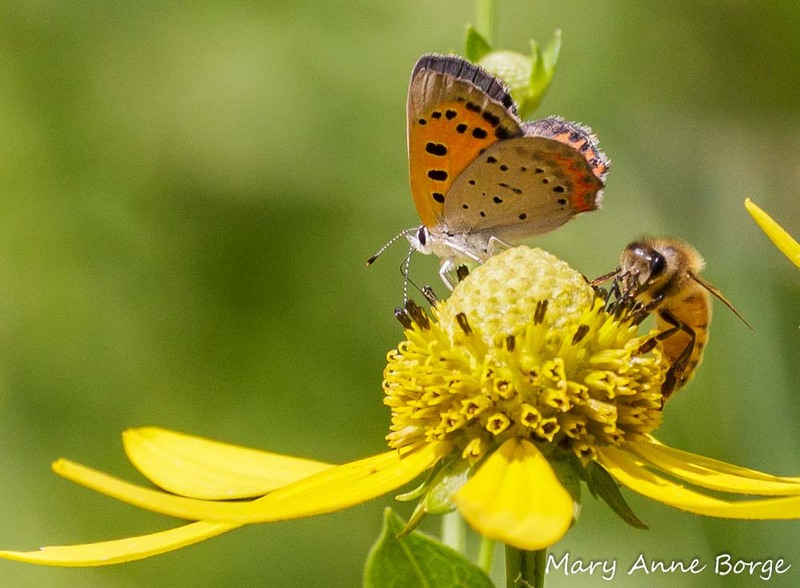 Often multiple insects can be found feeding simultaneously on different flowers in the same flower cluster. 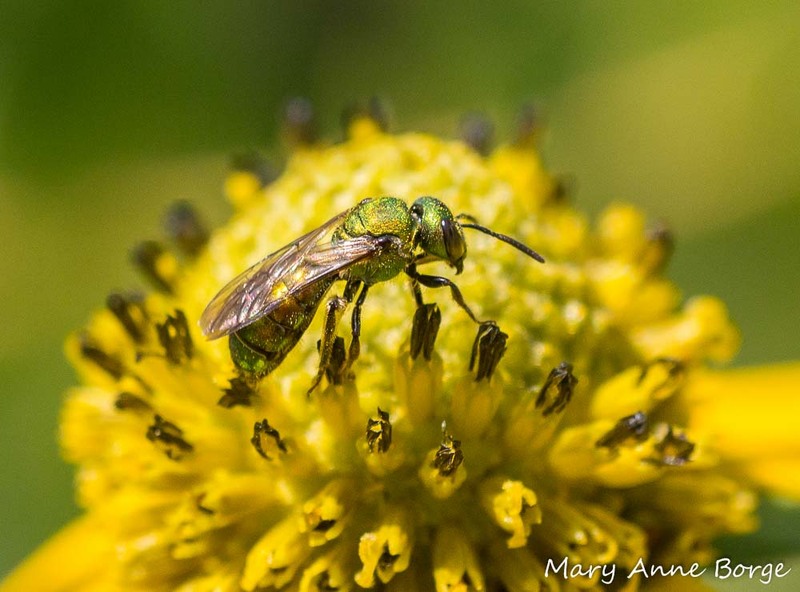 This Green-headed Coneflower offers enough flowers with nectar to feed both an American Copper and a Honey Bee. 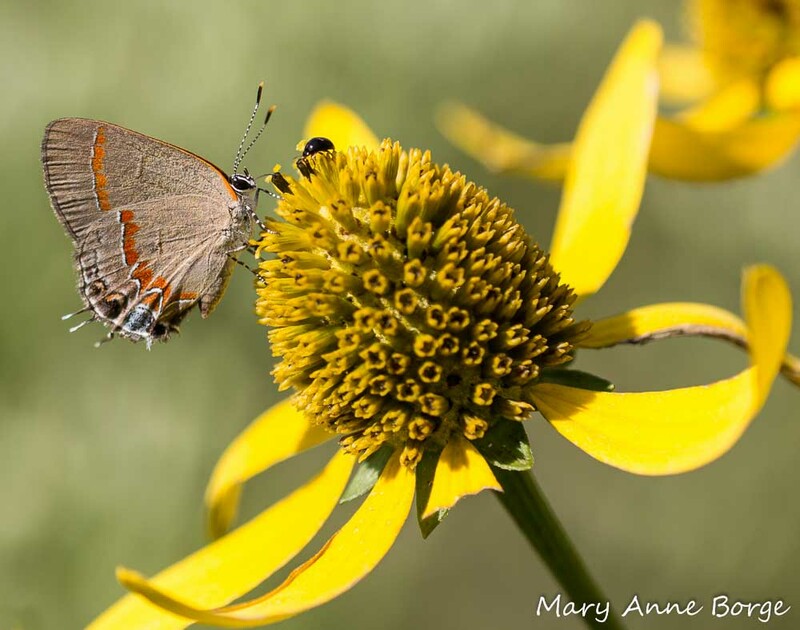 Green-headed Coneflower’s disk flowers are large enough to accommodate small to medium sized butterflies like those pictured here. They may rub against some pollen and transfer it to another plant, assisting with pollination. Beneficial predators like the thread-waisted wasps (a species of Sphecid wasp) pictured below also benefit from the abundant nectar, giving them the energy they need to reproduce. (I often see this species mating and nectaring at the same time, as they are doing here. A level of skill and coordination to which humans can only aspire!) 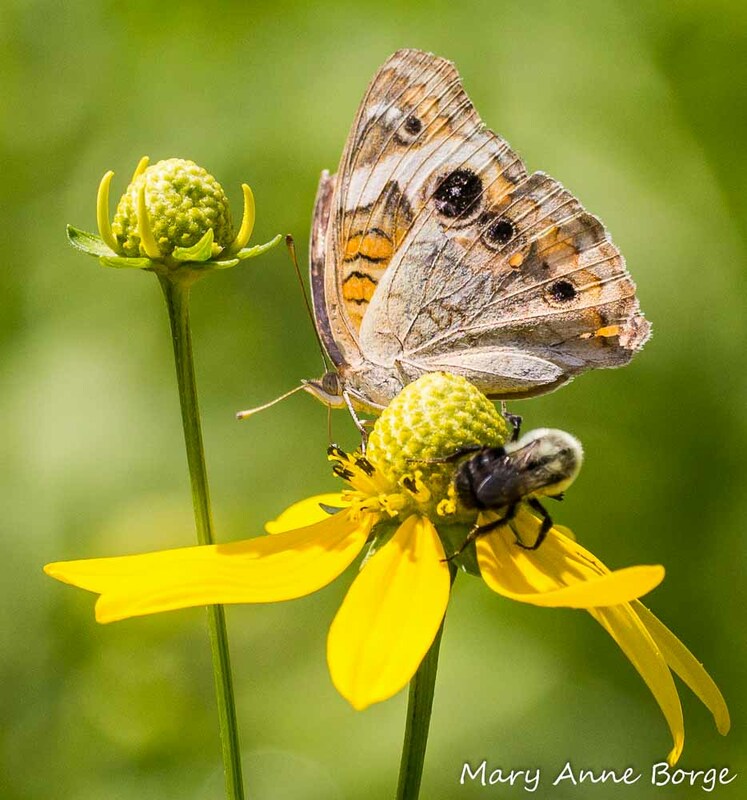 Their anatomy makes it more likely that they will help with pollination than butterflies, since more of their bodies are likely to come in contact with pollen. The female wasps of this species (Eremnophila aureonotata) hunt caterpillars to feed their larvae. 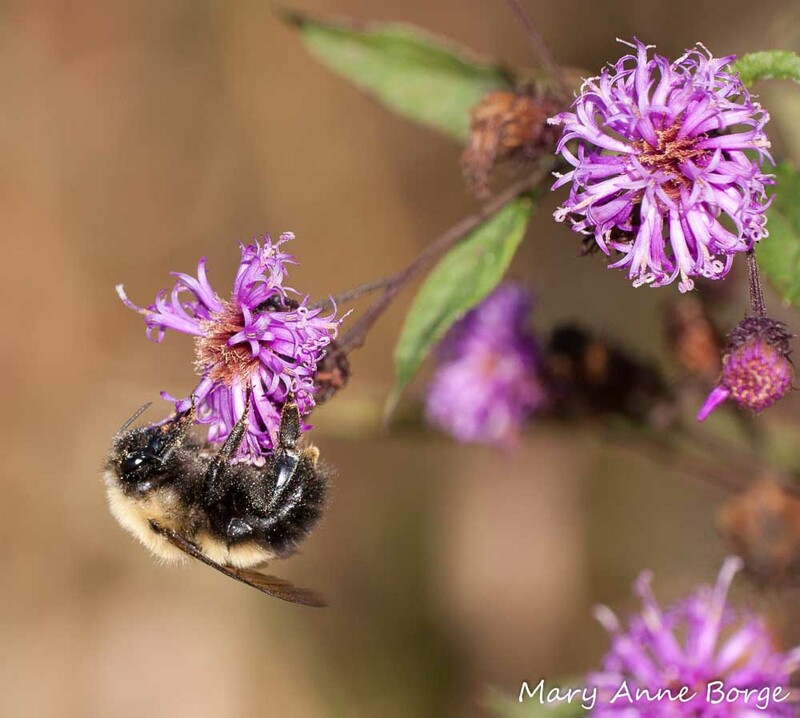 But bees are the most likely to be successful pollinators, because they are the best anatomical match for gathering pollen, and it’s more likely to stick to the branched hair on their bodies and be carried away to be deposited on another flower. 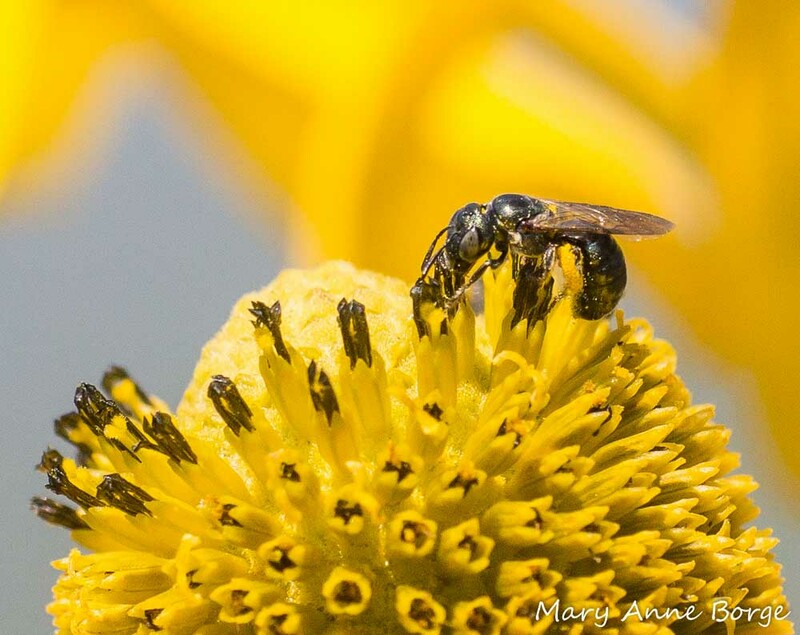 The Sweat Bee below is gathering pollen on her hind legs to take back to feed her larvae. Only female bees gather pollen this way. 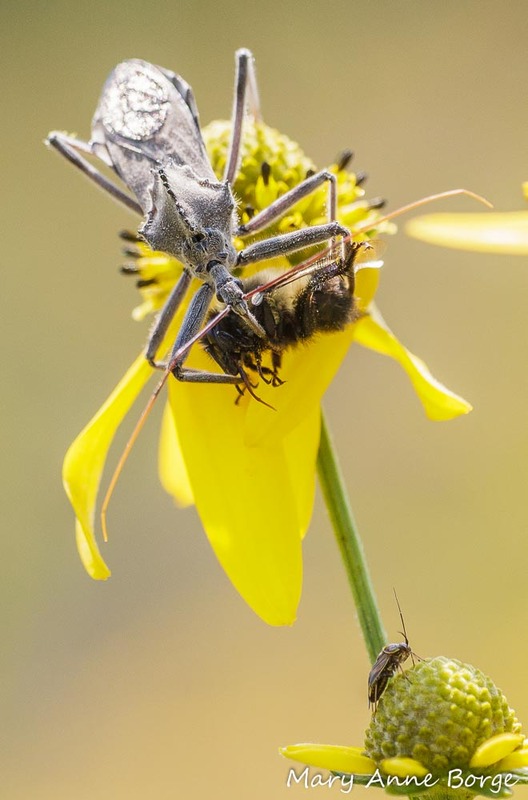 Dining on Green-headed Coneflower is not without danger, as this Bumble Bee found out when it fell victim to a Wheel Bug, a type of assassin bug. Sometimes the diner becomes the dinner. 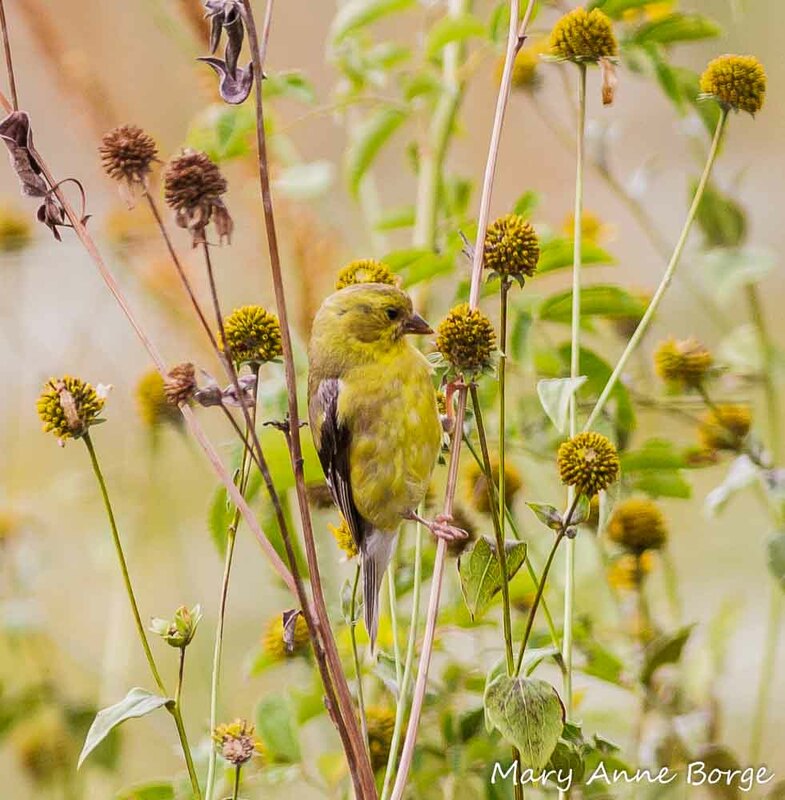 If the flowers are successfully pollinated, you’re likely to see Goldfinches and other birds feeding on the seeds later in the season and throughout fall. The Aster family is the second largest family of flowering plants in terms of its number of species, second only to the Orchid family. In late summer and fall the Aster family represents a high percentage of what’s in bloom. For information on a few other Aster family members, see Asters Yield a Treasure Trove! and Fall Allergies? Don’t Blame Goldenrod! Elpel, Thomas J. Botany in a Day. 2006. 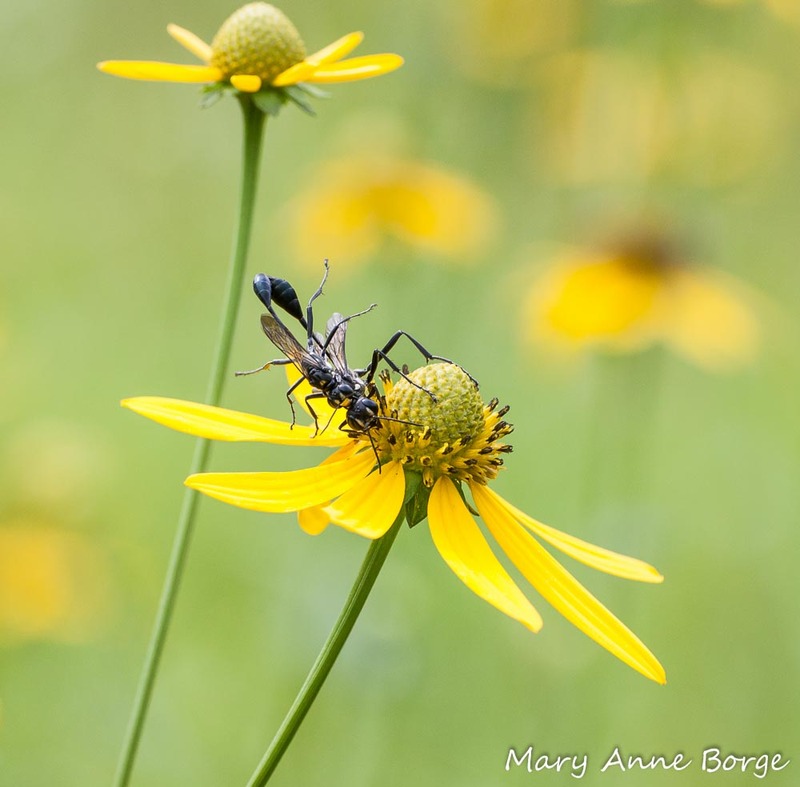 This entry was posted in Birds, Butterflies, Gardening for Wildlife, Native Plants, Other Insects and Spiders and tagged Aster family, Bees, bumble bee, Green-headed Coneflower, nature, Rudbeckia laciniata, Sweat Bee by Mary Anne Borge. Bookmark the permalink. Amazing photos and content, again! Frankly, I can’t believe you do this for free. And that I get to benefit from your talents. I am learning so much and so are my boys. Thank you! Thanks, Jess. It’s just fun! Someday I would like to take one photo as amazing these… Another informative and visual delight from The Natural Web! Thanks, Jean, but I think you’re already taking pretty great photos! Great blog entry! You have superb pictures and very informative dialogue! Always a treat to read your blog! !